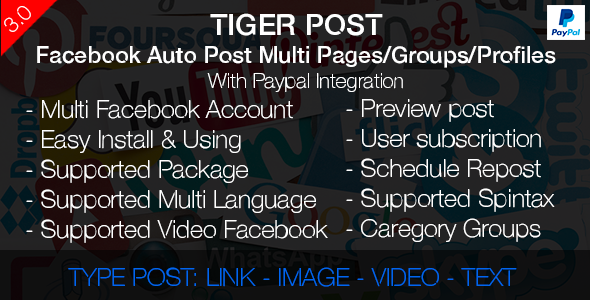 Tiger Post – Facebook Auto Post Multi Pages/Groups/Profiles with Paypal integration Created by tienpham1606. This templates have specific characteristics, namely: Tiger has features such as High Resolution: No, Compatible Browsers: IE11, Firefox, Safari, Opera, Chrome, Edge, Software Version: PHP 5.4, PHP 5.5, PHP 5.6, MySQL 4.x, MySQL 5.x . You can use this Tiger Post – Facebook Auto Post Multi Pages/Groups/Profiles with Paypal integration on Php scripts category for analytics, auto post, chart, facebook, paypal, post image, post link, post video, poster, social and another uses. What’s new on version 2.0.1? Manage your schedule posts and statistical success rate of the posts. That prison timely help you plan your business promotion. – Support four post types Text Post, Link, Image And Video. – Support multi facebook account helping you advertise more comprehensive. – Report posts statistical success rate of the posts. – Repost post Lets you automatically post back every day without having to post back. – Random post Automatically selects a random group/page/profile to post in a specified time. – Suport multi language makes it easy to access and use the product thoroughly. – Easy Customization and Multi themes Helping you have more choices for the management interface to suit you. – Support multi user Not only can you manage that you can share it with everyone you want. – Easy Install & Using help you set up and use easily. – Support video youtube You can upload videos from youtube. – Support post Closed Groups You can post on Closed Groups.